This is not a Google Street View truck. It's actually a self-driving car. 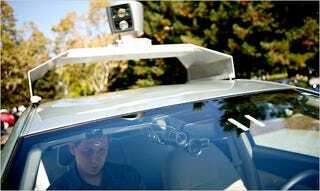 The car is part of a new research initiative that Google's been road resting: Artificially intelligent cars that drive themselves. Self-driving cars are admittedly a lofty, almost far-fetched prospect. Even the most optimistic people behind the Google team say it's at least eight years away from reaching consumers. But the promise it holds! With self driving cars on the road, researchers say road capacity can double since robots will drive at closer distances from one another. Plus, robot cars can theoretically react faster than humans and with the right sensors, can see the road from a 360-degree perspective. Not to mention they never get drunk, sleepy or text while driving either. A Prius equipped with a variety of sensors and following a route programmed into the GPS navigation system nimbly accelerated in the entrance lane and merged into fast-moving traffic on Highway 101, the freeway through Silicon Valley. The car then drove in city traffic through Mountain View, stopping for lights and stop signs, as well as making announcements like "approaching a crosswalk" (to warn the human at the wheel) or "turn ahead" in a pleasant female voice.